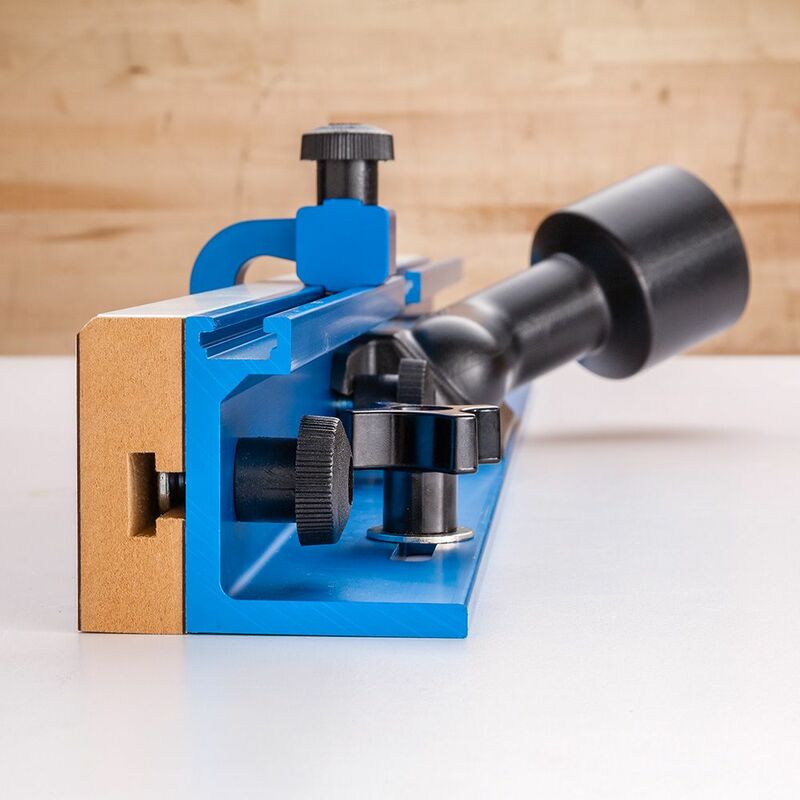 A full-featured, fully adjustable fence for your drill press—includes instructions to build your own drill press table! 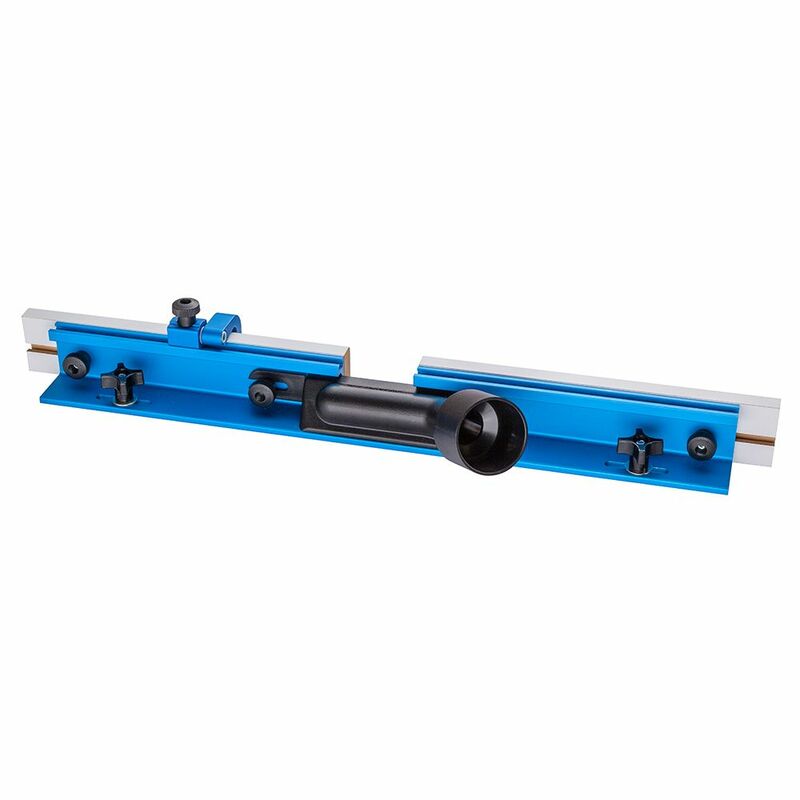 Get easy adjustability and precise repeatability on your drill press with the Rockler Drill Press Fence. 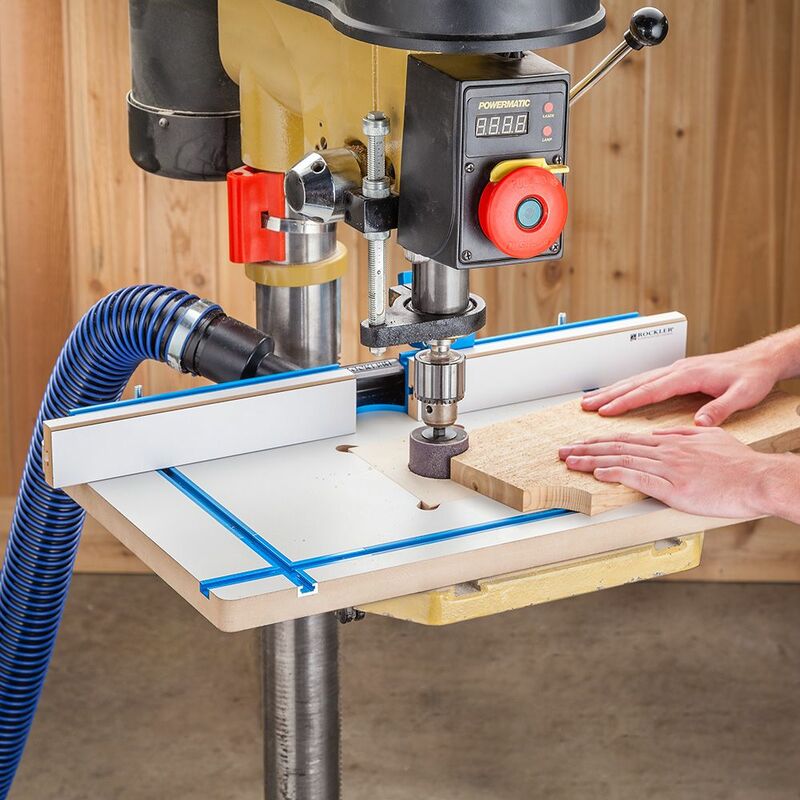 The fence features adjustable MDF faces that let you straddle large forstner bits and sanding spindles, plus a flip-down stop for precise placement of a wide variety of holes. 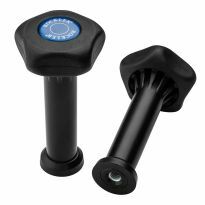 The included low-profile dust port fitting is specially designed for minimal obstruction with the drill press column, retaining up to 3'' more throat depth over typical dust ports. It also angles up and away to keep the hose from impeding movement of the fence on the table. 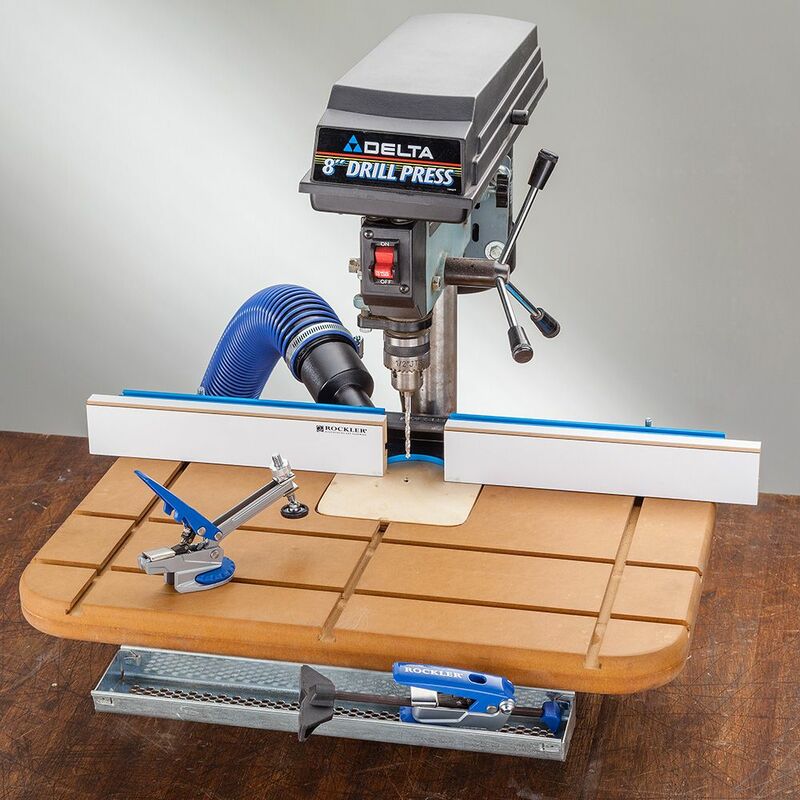 You can design your own drill press table or build the table outlined in the instructions, a design that's easily customized to fit the needs of your drill press. 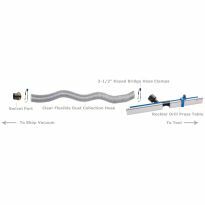 Mounted via T-tracks or thru-slots, the fence is quickly positioned and secured with the included hardware. Fence Depth (with MDF Face): 2-3/4"
Love this fence kit. 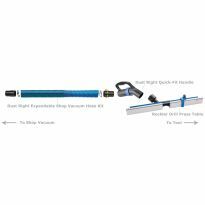 , I checked around at several complete drill press tables and fence kit but was not satisfied with the quality and accessories! I decided on Rocklers and built my own! 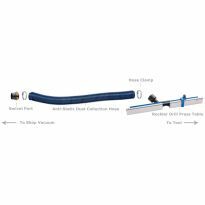 I previously purchased just the vac port and then saw this on sale. I love the aluminum behind the MDF which gives this a boost over the custom piece that I previously made. Received by request as a gift from my wife. 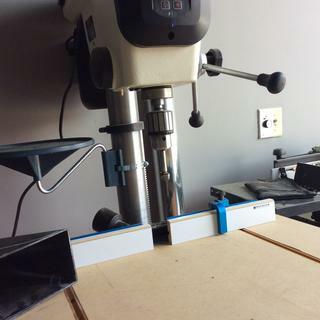 I had wanted to build a drill press table for years and finally decided to do it. I first used the fence before making a the table while building my tablesaw crosscut sled. I clamped it to the drill press' metal table on top of a piece of plywood to drill some holes all at the same distance from the edge. I was amazed by how well the dust collection worked. I then built my drill press table from scratch, photo included with this review. Rockler fence with my home-built drill press table. This is a great addition to my new (shop built) drill press table. It's of high quality and a value for the money. The built in dust collection port is also a real plus. Have’t used it yet. Can see it will be handy. The dust collector is great! Used this with a table I made - very solid, simple and reliable. Very happy! A very good fence for the drill press. It makes it so much easier and quicker to do repeated holes drilled. All I needed was a durable fence that I could build a drill press table around. The Rockler fence was perfect for my needs. I really like this drill press fence. It has everything I've been looking for and could not be happier with it. I have a JET JDP 17DX woodworking drill press and needed to drill new holes on the hold down portion of the fence to fit the Jet drill press table and the fence still looks like it was straight from the factory. I've owned my drill press for a year and FINALLY found the fence I was looking for. Thank you Rockler - WELL DONE! The stop is very useful. The dust collection port only exits to the left, but my permanent dust collection hose is on the right. The collection piece should be reversible for left or right location. 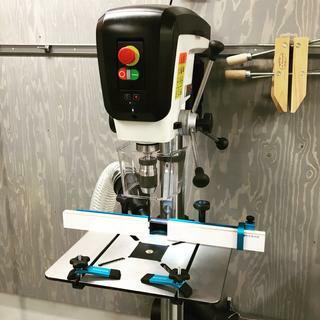 I built a new drill press table from the instruction drawing provided in the kit. I just added this to the drill press table I made. I haveen't had the chance to use it yet, but it is a whole lot better then what I had. This should add pleasure and ease to all my drilling projects. Really like it. Should offer a hardware kit for the table. Really like the new fence, but it would be a great addition to have a couple of right handed stops as well as the left handed ones that are included. 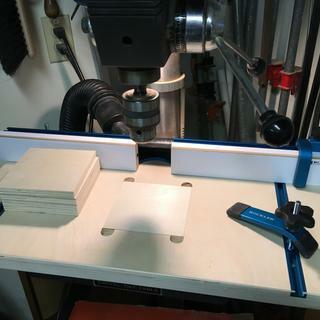 Improved design, especially the top stop but it is shorter than the prior version and would not fit the rocker drill press table, so I had to modify the original table to make it work. I built a custom drill press table and decided on this fence instead of making my own. 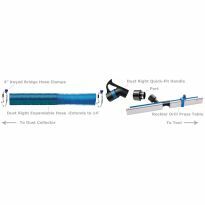 I love the vacuum attachment and the adjustability is great - everything moves very smoothly! The only thing I'd change is the width of the base as the 4 wing knobs used to clamp the base to my table and too close to the fence. I have small hands and have to grip the knobs with only my fingers, but those with large hands, might find it cumbersome, It would be nice to be able to grab the entire knob in the palm of my hand to ensure the knob is tighter. Instead of the widening the base, the knobs could be raised up above the fence with a bushing and a longer t-track bolt. Other than this one small annoyance, I love this fence! Nice quality and design. Would be better with a larger air flow volume at the pick up point. Not sure why the line size is necked down so much. Picks up a lot of the chips but many escape that would be collected with higher air flow rate. The fence is great, but there are two areas that bother me. Like others the adjustment knobs are to short. I new this when I bought it so i went ahead and bought the easy to grip ones (http://www.rockler.com/rockler-easy-to-grip-5-star-fence-knobs-pair) when i was in the store. The other complaint is the thickness of the fence. I wish the center opening and dust collection port were a little narrower. I only have a 8in drill press and you loose about 3 inches of working space with this fence. My old double stacked 3/4 in ply fence only lost about 1 3/8 inch of working space. If the port was thinner and the support for the fence opening was around the opening instead of the back, it would allow for less lost space. All and all, if you want dust collection capabilities and the ease of not having to build your own fence, this is great. I had considered making a fence for a new drill press table, but the Rockler fence is much better than I would have made. The only complaint is that the knobs that hold the fence to the table are very close to the back of the fence, and one is almost covered by the duct collector, and are not easily tightened. I would recommend this fence. Good fence. Solid construction. Dust port works great. My only gripe is that the adjusting knows for the table are really close to the knobs for the actual fence. Makes it a little bit cumbersome to get to. Other than that- I would highly recommend the fence. I was disappointed to learn that this fence does not fit the older Rockler Drill Press Table/Fence that I have had for many years. I needed to replace the Fence on this older table so I ordered the new one. I got it to work, but I had to drill holes in my table and it is not as wide as the original fence. Other than my personal problem, the fence is of great quality. Would have been nice if they had warned that it does not fit the t-track slots of older Rockler Drill Press table. Works fine after modification to fit. I have a new jet drill press ready for metal drilling and do mostly woodworking in my shop. Everything I’ve seen out there just doesn’t meet my standards, so I’m making my own table and using these Rockler accessories! 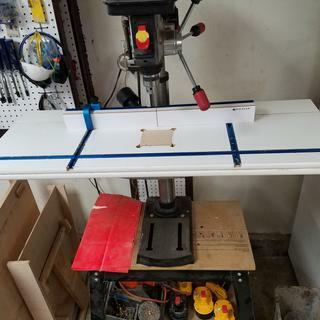 Plan on making a better drill press table. Needed fence for Jet drill Press. I cannot build a drill press fence this nice for this price. I can't make one as nice for the price. Please consider a 32" version for larger tables. I got a new drill press. Need this fence. I have the original Craftsman cast iron table on my drill press and while it will probably outlast me, this fence and the table I'll build from the instructions will work much better for precision work. I've been wanting a good drill press fence with adjustable stop at a affordable price. I am purchasing a new drill press and need a fence for repeating drill holes. I picked this because I'm just starting to build my shop and lack experience in crafting and building my on, and reliance on the guarantees of this company. 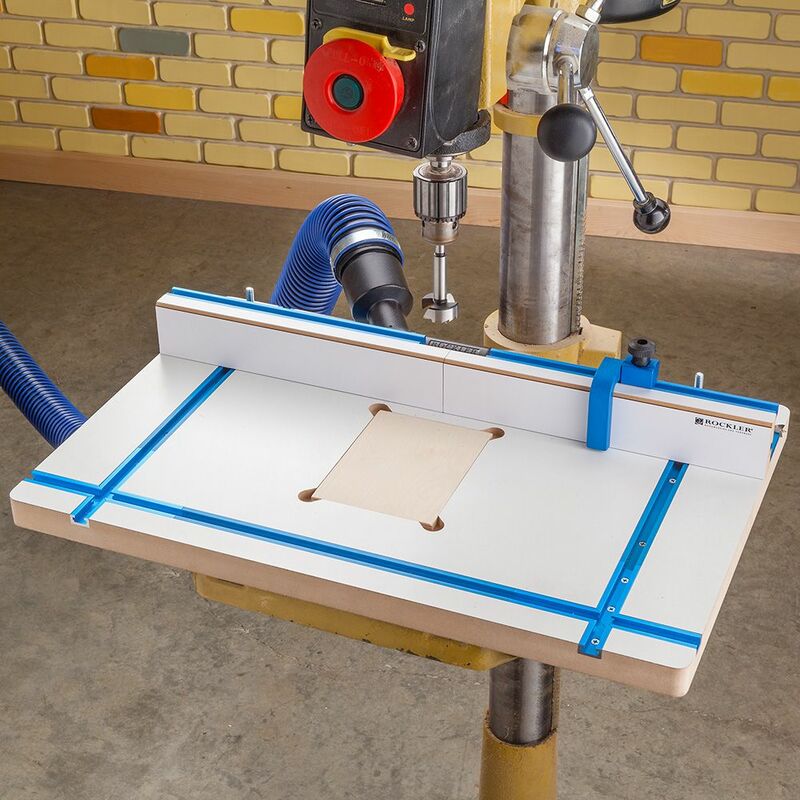 For a DIY drill press table. Tried it and it doesn't seem to work that well. Safety and accuracy on the drill press. Need to add an expanded table to my drill press and I don't think I could build a fence with these features as inexpensively as the sale price for this unit. The only fence that has an integral dust port. My dad requested it as a birthday gift. Adjustable means of drilling holes for Blum concealed hinges on drill press. I need a fence for my drill press and this one has a nice vacuum connection. I am building a drill press table. Bought to build table for drill press. Setting up a drill press and other reviews seemed to give positive feedback. My old Delta table drill press had the iron table and I was always fussing and re-measuring to make sure the hole was in the right place. Now I make one set-up with the fence and can drill away to my hearts content. A fence is a backbone of a drill press table. The large central work area , dust control, and flip stop allow efficient work at the drill press. I've been looking for sometime and could not beat the price (on sale) for the components to build my own. To upgrade my current system. This replaced the fence that came with the drill press table. Like the fact of having the vacuum port as well as the built in stop block attachment. Wanting to build drill press table. Setting up drill press to do a better job and be more consistent with quality of work. Looked good, and I wanted a good fence that adjusted,and also with a dust port. 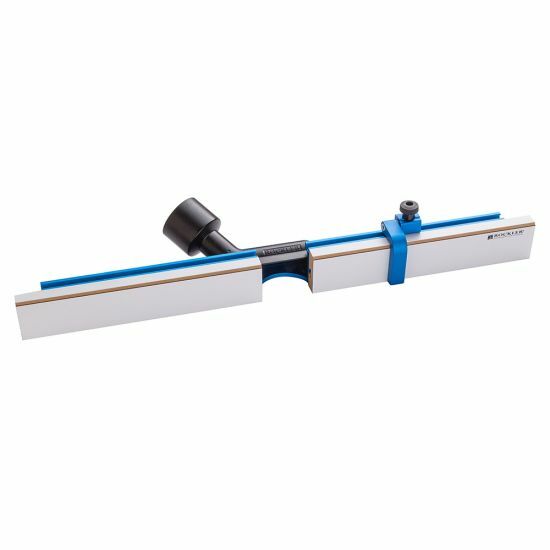 Does Rockler sell a table top that will match up with this item as opposed to having to build it myself? I know this sounds lazy but I feel like a professionally made one will have tighter specifications than anything I could do and would give me more consistency in my finished products. BEST ANSWER: I made my own Jeff but to my own needs. Your needs may be different. I have done an extensive search and it appears they do not. But, it does say in the description that the fence includes plans to build your own table. Are additional flip stops available? BEST ANSWER: Buy a 2 1/4 stop. it is the same as what comes with the fence. Yes. 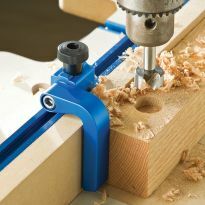 Search for flip stops on the Rockler website. 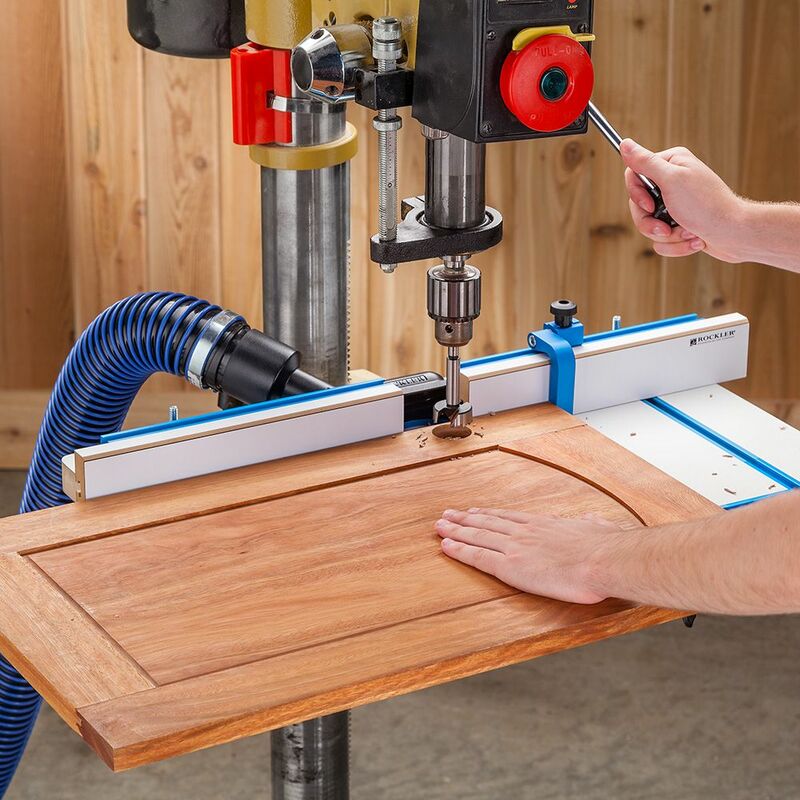 What is the difference between the this router table fence and the drill press fence? They appear to be the same design. BEST ANSWER: The Router fence is taller(by about an inch?) and wider(32" vs 24"), also the center above the bit is connected compared to the drill press fence. 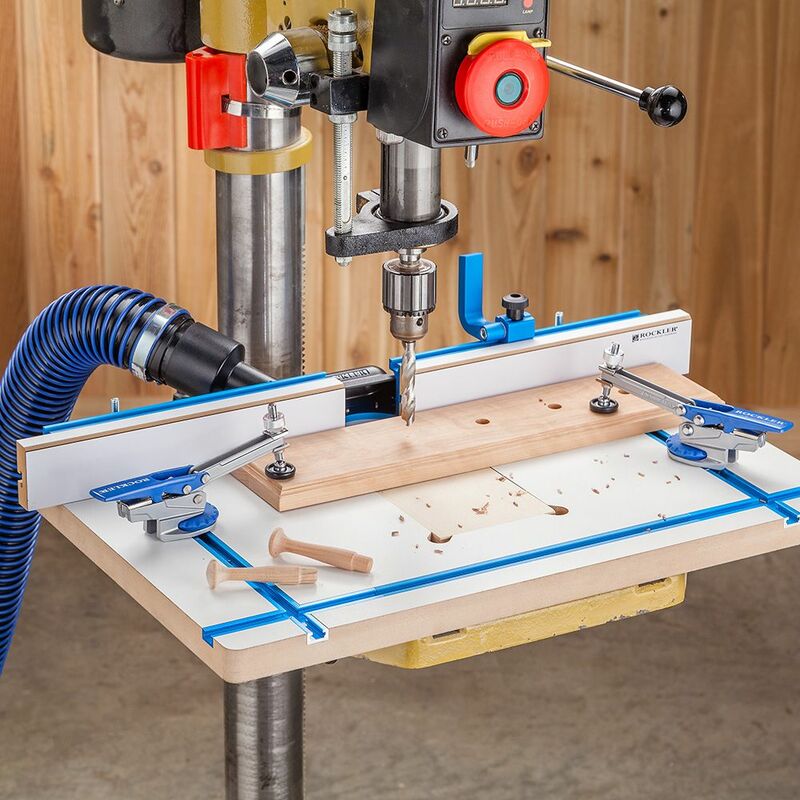 Does the drill press table plan included with the fence feature the rectangular table insert shown in the photos above, or does it feature the circular insert shown in the "see it in action" video (which requires a CNC machine I don't own)? BEST ANSWER: The Table Plan that came with the fence, shows a 4" W by 5 1/2" front to back - Rectangle. I made mine 4" Square, positioned so the drill point hits center left to right, but hits 1 1/4" from the top of the insert. This allows me to rotate it 4 times on each side before putting in a fresh one. I just realized there is an easy way do make the circular hole. 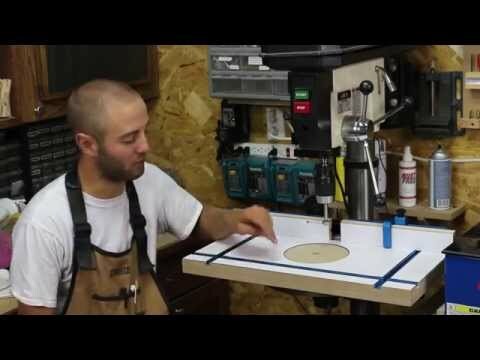 In the video, he glues the two pieces of mdf together, then uses the cnc to cut out the disc. Instead of doing things in that order, just cut the hole in one piece of the mdf first, then glue them together. I should have thought of that to begin with. The cnc would be a lot more fun though. I believe the plan does show how to make a rectangular or square insert block. I placed a square block of wood in mine for a sacrificial piece. I basically completed the design then mounted it to my drill press then located the point where my bit impacts the table. I did not set the impact point as the center of the cutout, instead off setting it by about an inch, so that way a square block could be turned when it had been drilled into four times. Additionally as the video shows you can flip the block upside down and use it four additional times. Hope that helps. It features the rectangular insert shown in the photos. While the instructions include specific dimensions and a cutting template for the insert, you could modify them to fit your needs. I used two hole saws that were close in size. I drilled the hole with a 3-1/2-Inch and the insert with a 3-5/8-Inch. Not quite as clean as a CNC machine though. No, but It explains how to make the insert and how to make the cavity the insert sets in using a router. The drill press table instructions that came with my fence show the rectangular insert. What size are the bolts for the t track? BEST ANSWER: The bolts that attached the fence to the drill press table are 5/16. The fence stop that rides in the track at the top is also 5/`16. The track the fence bols ride in and the track on the top top of the fence are the same: the standard Rockler track - 9/16 wide track that receives a 1/2 rounded rectangular head on each of the 5/16 bolts. Hi Tom, i have no idea on the size of the bolts. Im not at home right now but can check latet. I have already made a drill press table with T tracks in it. How far apart are the slots for mounting the fence to the table? center. This is accomplished by the two 2" horizontal slots towards each end of the fence. I made mine 19.0 ". According to the technical details in their ad the fence will fit tables with track spacing of 16-1/4" to 19-3/4" apart. 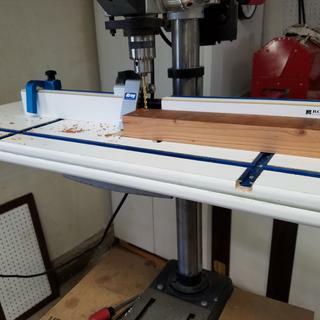 The Rockler fence needs 16” or more spacing betweenthe drill press’s T-slots to anchor the fence to the table. Is there a way to adapt it to fit the Delta 18-900L’s table whose slots are approx 7-8” apart? BEST ANSWER: Don’t think there is a way to adapt the fence to the 7-8 inch spacing unless you want to modify the aluminum base by drilling holes in the aluminum and moving the t-bolts. i had that problem with my Jet drill press table. My solution was to make a nice big sturdy table out of wood, and put T-tracks in the bottom of it to fit the Jet table and several sets of T-track in the top with spacing to fit the Rockler fence. That design let me also use hold downs. Hope this helps. Sorry, I have a custom table for my drill press and could not use the Rockler either. It's in a box for next garage sale items. Would this be suitable for a 10" Ryobi drill press? Has anyone tried making a table and using this drill press fence on a table top drill press or is the factory drill table too small to support it satisfactorily? BEST ANSWER: Yes you have to make a table for drill press. Go to Woodsmith and type in drill press table in search . I made the table w/. Adjustable extensions for long pieces that need to be drilled. I made a table top that fits over the factory table. I put Rockler T Tracks in it and works great. In the drill press table plans, how far back from the front edge is the crossrail? I didn't use the drill press plans. I made my own table. You can make the table as you wish. Can this fence be used on a 24 inch router table?